Samsung continues to expand its mobile payments service to more markets across the globe. 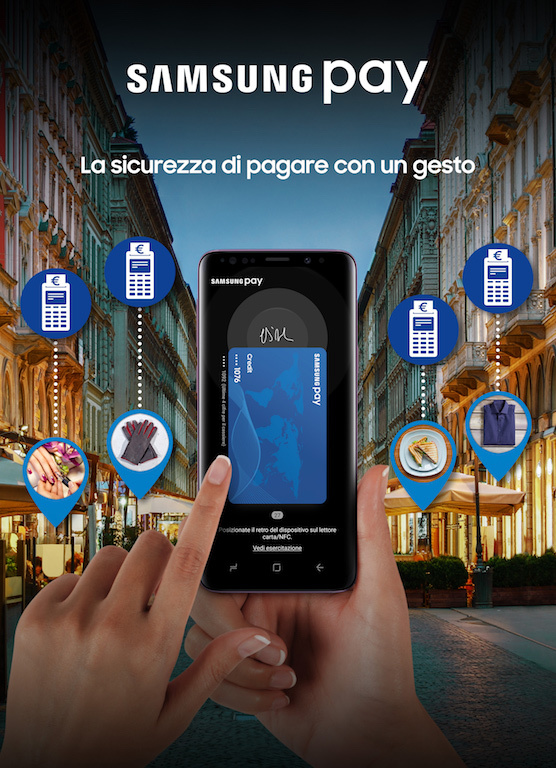 The company has announced today that Samsung Pay is now available in Italy. This is the 21st market for Samsung’s mobile payments service, making Samsung Pay one of the most widely accepted payment solutions in the world. Samsung Pay has proven to be an award-winning service for the company. It was most recently recognized as the “Best Mobile Innovation for Payment” at the annual Global Mobile Awards during the Mobile World Congress 2018. Italy is the latest market to receive Samsung’s mobile payments service. Samsung Pay is available to users in Italy as long as they have a compatible Samsung device. They will be able to make payments through it almost anywhere in the country where they can already pay using conventional debit and credit cards. It’s this flexibility that sets Samsung Pay apart from the competition. The service supports both NFC and MST payment technologies which eliminate the need for merchants to have dedicated terminals for Samsung Pay. They can accept this payment method using existing payment card machines. Samsung Pay can also be used for storing membership cards and promotional coupons. Some value-added features will be available exclusively to customers in Italy, such as discounts of up to 20 percent on popular brands such as Moleskin, Daybreak Hotel and Leroy Merlin. Devices compatible with Samsung Pay in Italy include the Galaxy S9/S9+, Galaxy S8/S8+, Galaxy S7/S7 Edge, Galaxy Note 8, Galaxy A8, Galaxy A5 (2017) and (2016) as well as the Gear S3 and Gear Sport. The press release that Samsung has sent out today doesn’t confirm which banks will be supported at launch but seeing as how the service’s arrival in Italy has now been officially confirmed, we might find out soon enough which Italian banks will support the service at launch. The Samsung Rewards program, which offers points in exchange for purchases, has not yet been launched in Italy. Is UK the only market to NOT get MST functionality?! portugal dont even have samsung pay yet…..